Mr. Melvin never received the book. According to his lawsuit, he was told by an official at Kilby that the book was “too incendiary” and “too provocative,” and was ordered to have it sent back at his own expense. A spokesman for the Alabama Department of Corrections said officials had not seen the suit on Monday and could not comment. Mr. Stevenson, who is also the director of the Equal Justice Initiative in Montgomery, said he considered the lawsuit to be less about the rights of people in prison but primarily about the country’s refusal to own up to its racial history. StoryCorps Atlanta has an interview between two staff members at the Southern Center for Human Rights: staff attorney Melanie Velez, who has worked on prison overcrowding and abuse cases in Georgia and Alabama, and social worker Vivianne Guevara. It’s only about 3 minutes — worth a quick listen! With state prisons stuffed beyond capacity and no signs of any slowdown in the volume of drug and theft cases that fill court dockets, Alabama’s judges are being asked to rethink the sentences they issue. The message came last week as all Alabama judges with power to sentence prisoners were invited by Alabama Chief Justice Sue Bell Cobb to a three-day meeting in Montgomery. Cobb wants to find ways to reduce jail overcrowding and still enforce Alabama’s laws in the face of significant state budget problems. She has said Alabama’s prisons are operating at 195 percent of capacity … . Alabama has the nation’s sixth highest incarceration rate; state prison costs quadrupled in 20 years to $577 million a year in 2008, and half of all new inmates in the system in 2009 were imprisoned for drug offenses, according to the chief justice. I had previously noted Sue Bell Cobb’s interest in criminal justice reform a few months ago, here. This year’s conference will offer plenaries, workshops and roundtable discussions on issues relating to sentencing practices and the hurdles sentencing commissions and criminal justice officials must overcome during these times of shrinking budgets and scarce resources, as well as innovative ways that states have faced these challenges. Welcoming the conference attendees will be Alabama’s Chief Justice Sue Bell Cobb, Federal Circuit Judge, Bill Pryor, former Attorney General of Alabama and leader in establishing Alabama’s Sentencing Commission, and Commission Chair, Retired Circuit Judge Joe Colquitt, Beasley Professor of Law, University of Alabama School of Law. — Sue Bell Cobb, Chief Justice, Alabama Supreme Court. 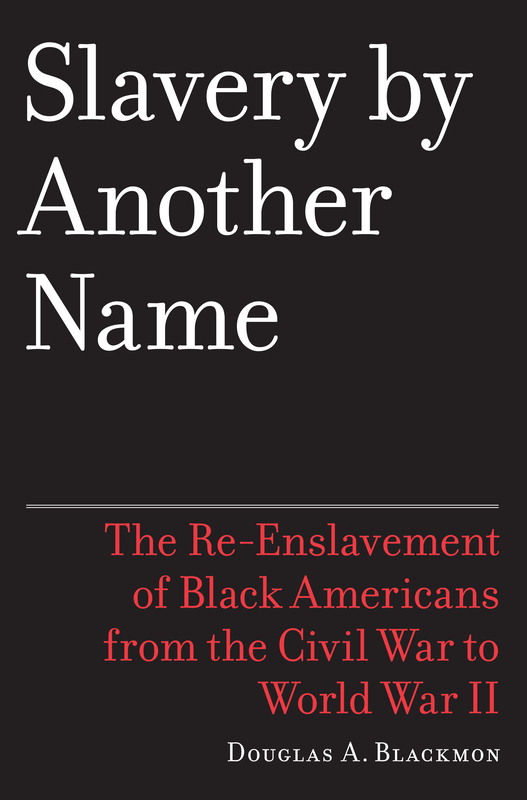 Slavery by Another Name (Doubleday, 2008), by Wall Street Journal reporter Douglas Blackmon, exposes and meticulously documents the complicity of Corporate America with the efforts of Southern states in the aftermath of the Civil War to essentially re-impose slavery via convict labor. Throughout the South, between Reconstruction and World War II, tens of thousands of black men were arrested on trumped-up or minor charges and then leased out as laborers to companies ranging from small-town entrepreneurs to major corporations such as U.S. Steel. The Pulitzer Prize winning book is being adapted into a documentary film to debut on PBS in 2011. Reading the book, Robert Corley, director of [the University of Alabama at Birmingham]’s Global and Community Leaders Honor Program, was shocked to discover something he’d never known about his great-grandfather, Robert Franklin. Franklin, a constable and shopkeeper in Goodwater, was convicted of rounding up blacks and essentially selling them to a plantation owner. Franklin was fined $1,000. Corley said no one in his family knew the story and they have been struggling to comprehend it. Franklin continued in business. When he died in 1946, Franklin’s estate was worth about $1 million. Corley said his own ability to go to college and obtain advanced degrees was in some part due to Franklin’s prosperity. Corley, who helped design the Birmingham Civil Rights Institute and was a founding member of its board, wonders about the damage done to the men his great-grandfather arrested. Odessa Woolfolk, the BCRI’s former board president, said more attention should be paid to the period between Reconstruction and the civil rights movement. Some worry about bringing up the story, but the facts need to be faced, she said.